Fashion In The Forest: Throw Me Somethin' Mister! 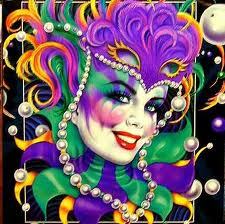 The first Mardi Gras in New Orleans happened in 1857 and was celebrated by the Krewe of Comus. Krewe's are groups with hereditary membership whose members organize and participate as costumed paraders in the annual Mardi Gras carnival. 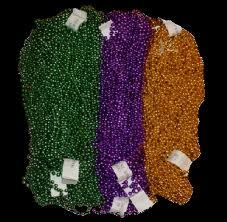 The colors of Mardi Gras are Purple, Green & Gold. Purple represents JUSTICE, Green represents FAITH and Gold represents POWER. In order to organize and stage the enormous Mardi Gras carnival every year, many New Orleans families have belonged for generations to krewes, groups that create elaborate costumes and floats for the many Mardi Gras parades in the two weeks leading up to "Fat Tuesday." Not only do the krewes participate in the parades, but, as leaders of New Orleans society, they also hold balls and other elaborate events during the carnival season, which lasts from Christmas up to Mardi Gras itself. The krewes are responsible for electing Rex, the annual king of the carnival, whose parade is the climax of Mardi Gras. Krewe is only an imitation of an old-fashioned spelling of crew in its standard meaning, but the word, thanks to its association with Mardi Gras and New Orleans high society, has taken on some of the mystique of the carnival. New Orleans practically shuts down for these entertaining floats and intense displays. Last year’s Super Bowl MVP, Saints quarterback Drew Brees, was the King of Bacchus. Actor Andy Garcia is the 2011 King of Bacchus. New Orleans is known for its Cajun cuisine of spicy dishes like jambalaya and gumbo, but no Mardi Gras meal is complete without King Cake. 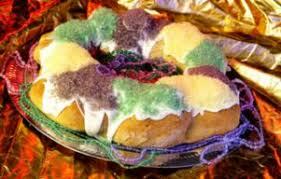 King Cake represents the religious event of Epiphany. A cinnamon roll like circle of braided dough is cooked, then iced and colored with purple, green and gold sugar and a small baby figurine is placed inside. Tradition states that whoever finds the tiny baby in their piece of King Cake is supposed to buy the next cake. 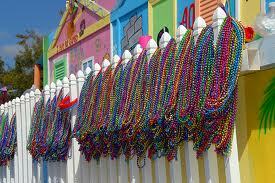 Think Mardi Gras, and you think of beads and colorful costumes. You can buy a festive mask or simply create one of your own. Masks have been worn for centuries, starting with the upper class and undercover organizations, mainly at Mardi Gras balls. New Orleans is famous for its jazz. Feel-good music, like Mardi Gras mambo, makes up the soundtrack for Fat Tuesday. Listen to festive tunes or buy music for your own Mardi Gras party. When you're ready for the big experience, you'll need to know when it will be! You'll find the big day can fall on any Tuesday between February 3 and March 9. Carnival celebration starts on January 6, the Twelfth Night (feast of Epiphany); and picks up speed until Midnight on Mardi Gras, the day before Ash Wednesday. How will you know which Tuesday it will be? Ash Wednesday is always 46 days before Easter and Fat Tuesday is always the day before Ash Wednesday. Easter can fall on any Sunday from March 23 to April 25 with the exact date to coincide with the first Sunday after the full moon following a Spring Equinox! There you have it! Voila! If you're still confused, get out that calendar with the printed holidays on it--it's the day before Ash Wednesday! Thanks for stopping by my blog! I'm now YOUR newest follower! I am a new follower to your blog and in general new to blogging with only about 2 months experience and still learning and finding out I don't know as much as I thought. Would greatly appreciate a follow back! Thanks.